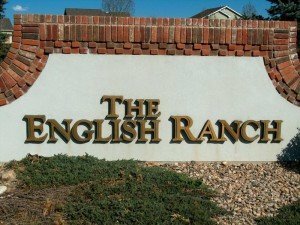 English Ranch is a Fort Collins neighborhood located close to many great amenities. You’ll have quick access to some of Fort Collins best schools and shopping centers such as the Super Target. If you’re looking to enjoy a nice day out, you can walk to a plethora of shops and restaurants or take your bikes just a short ride or walk away. The Council Tree Library is located in the Front Range Village so you could drop off some books and pick some new ones up to read. There is also a quaint dog park where you can let your dog’s run free off leash. Panera Bread, Sephora, Hu Hot and Five Guys Burgers and Fries are some of the many restaurants in this great shopping center. Homes began being built in this neighborhood in 1992, it is now an established neighborhood with lots of large trees and lot sizes are bigger than some you will see around Fort Collins. There are now 558 homes built in English Ranch with newer homes built ending in 2007. There are patio homes and single family homes available. Average home prices in English Ranch range from $229,000 to $355,000 making it an affordable option Fort Collins homebuyers who want to live in a great area. The homes start at 1500 square feet and go up to 4000 square feet. There is also a great neighborhood park with an awesome playground for the kids or the young at heart. For those who want to be conveniently located to I-25, the best Fort Collins Schools, and South East Fort Collins, this is a great neighborhood. Since the average home price in Fort Collins is $390,000 this neighborhood exemplifies a typical Fort Collins neighborhood and what you would get for a purchase price of $350,000-$455,000. Most homes in the neighborhood are 3 or 4 bedrooms with 2 and 3 car garages. Come see why so many people call it home.